Did you know that the foods you eat don’t just affect the way you feel? They also affect the way you LOOK. So if you’re unhappy with your skin, your DIET (not just your age and lifestyle) could be to blame. So if you want healthy, radiant skin, eating more of them is one of the smartest things you can do! But most people don’t know that. They end up spending stacks of cash on beauty “products” and spreading artificial chemicals on themselves hoping to look better. Drinking a few cups of green tea a day isn’t just relaxing — it’s one of the most important things you can do to look younger! Tea leaves are full of antioxidants that protect your cells, fight inflammation, and keep out harmful toxins. Green tea also has compounds called “catechins” that increase the blood flow and oxygen to your skin. This makes it easier to get nutrients, which keeps your skin look amazing. A 2011 study published in the journal Nutrition found that people who drank green tea every day for 12 weeks had smoother skin than people who didn’t. The green tea-drinkers even had less sun damage after they were exposed to UV light! University of Alabama and Case Western Reserve University researchers also came to the conclusion that green tea might even reduce your risk of skin cancer. One of the best ways to keep your skin healthy: avoid inflammation in your body. Reducing inflammation helps all kinds of skin issues, whether you’re battling a specific condition or just looking for a healthier glow. Eating more fish helps you do just that! Fish are full of omega-3 fatty acids. Most of us aren’t getting nearly enough of these. But they’re KEY to fighting inflammation. Studies have found that adding omega-3s to your diet reduces puffiness and improves skin health. Bottom line: eat more fish, and get smoother, younger-looking skin. You can find the most omega-3 fatty acids in cold-water fish like salmon, sardines, mackerel, tuna, and cod. Focus on those to get the most bang for your buck. 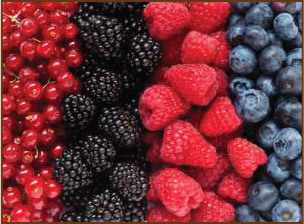 Don’t be fooled by their small size.Berries pack a serious skin-clearing punch! A study published in the Journal of Agricultural and Food Chemistry found that blackberries, blueberries, and strawberries have the highest “total antioxidant capacity” of any food. These antioxidants improve your skin by protecting it from aging, sun damage, and stress. Walnuts are great for your skin. According to Dr. David Bank, the omega-3 fatty acids inside them make your skin more elastic. Walnuts are the only type of nut that have a significant amount of omega-3s. Walnuts are also high in “biotin,” a B vitamin that helps moisturize dry skin and overcome conditions like eczema. Brazil nuts are loaded with selenium, a mineral that boosts your immune system and can reverse skin conditions like acne! It takes just two Brazil nuts a day to get enough selenium. Toss those in with a handful of walnuts, and your skin will look better in no time. Olive oil gets rid of toxins from your body and fights inflammation (which can lead to all kinds of health problems). That makes it good for your heart and brain… and also great for your skin. When you eat olive oil, you take in a good dose of antioxidants and healthy fats, which leave your skin looking healthier and younger. Getting enough “good fats” is a key part of keeping your skin healthy. A Japanese study found that people who ate more saturated and monounsaturated fats had fewer wrinkles and more elastic skin than people who ate less. 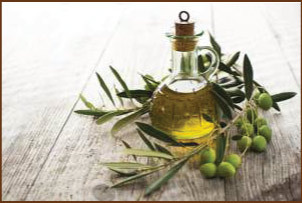 A 2012 study in the Public Library of Science found that the more olive oil you eat, the fewer signs of aging skin. Olive oil beat every other type of oil the researchers tested! Now that you know which foods make your skin look great, it’s time to make them a regular part of your diet. But it’s hard to know where to start. Trying to look up dishes and figuring out how to prepare them gets overwhelming fast. The Pete’s Paleo Eats Cookbook can help. We’ve teamed up with one of the most prominent chefs in the Paleo community to bring you dozens of nutritious, gourmet Paleo recipes in our new FREE cookbook. Learn how to make gourmet dishes like Mongolian Red Pepper Beef w/ Roasted Spaghetti Squash… in under 30 minutes. Shocking Revelations from Leah Remini’s Memoir!